The fantastic Orion AstroView 90 equatorial refractor telescope offers a great astronomical experience for the user with its acclaimed optical performance and large aperture size for great images. The AstroView would be suitable for beginners, but would probably add more value to an experienced person, who wants to step up a level, and who knows how to get the most out of a telescope with all of the additional extras that you would ever need. 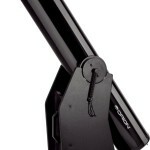 This telescope is more impressive than most people realize, at nearly 5 ft tall and more than 10 kilograms, this is certainly not a toy, but having said that, it is still an excellent telescope for the whole family to use. The Orion AstroView comes with all accessories such as 10mm and a 25mm eyepieces for that extra fine focus, a 6 x 30 finder scope, and even software that you can load onto your PC to help you understand the night sky, and to increase your viewing pleasure. 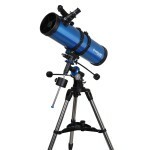 All refractor telescopes provide excellent clear images and with an aperture of 90 mm, you will have no trouble spotting fine details of the Moon, excellent details of the near planets, and many interesting stars and distant galaxies. With the addition of the quality eyepieces, you will be able to both frame accurately, and zoom right up close to see incredible sights such as Jupiter’s great red spot, or even a neighboring spiral galaxy – the choice is yours! The AstroView comes mounted on an Equatorial style mount which is designed for easy tracking and alignment of the object you want to focus on. To aim the telescope, you simply direct it towards the target, using the finder scope for direction, and once you get close, you simply use the slow motion control knobs to adjust the fine focus. 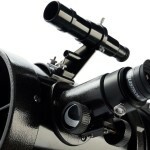 Whilst this telescope is a pleasure to use, you need to be aware that the telescope needs to be constantly adjusted to remain in focus on the particular part of the sky that you wish to focus on. If you find that it is too labor intensive to continually adjust the aim of the telescope, you could consider an upgrade to an automated adjustment system. Orion have an automated telescope adjustment mount known as the EQ-2M which is a battery powered electronic system, which can be added to this telescope at any time you choose. Once again, we really like the Orion AstroView 90 telescope because of the additional features and additional components that can be added to this system to increase the ease with which you can grow into this hobby as you gain more experience. The EQ-2 mount can be a little unsteady and if you bump the telescope it tends to vibrate right through the system, so you need to take care for the best user experience. 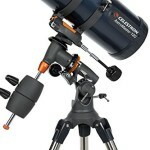 The Orion 9024 AstroView 90mm Equatorial Refractor Telescope provides you with excellent optics, a classical design package, and a very good range of accessories included in the price. 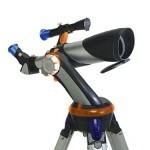 This superb telescope offering by Orion is an excellent introduction to the world of Astronomy. Click here to have a closer look and read the excellent product reviews at Amazon.